Quick poll question: How many of you have signed up for a free software trial and then cancelled it after getting the welcome email? Most people have at least once. Mainly because the welcome email was just so awful that there’s no way the software could have been good, right? For SaaS companies, this can be a big problem. Emails are the lifeblood of many SaaS providers, so losing subscribers (and by extension leads and customers) can be the difference between hitting a sales target and not. Let’s take a look at the top 3 ways you can craft better welcome emails for your SaaS customers. Recipients know what they’re getting, so don’t worry about cluttering up the headline of the email. It sets up the expectation with customers that you’ll give them what you say you’re giving them. The welcome email is truly a welcome email, no more, no less. 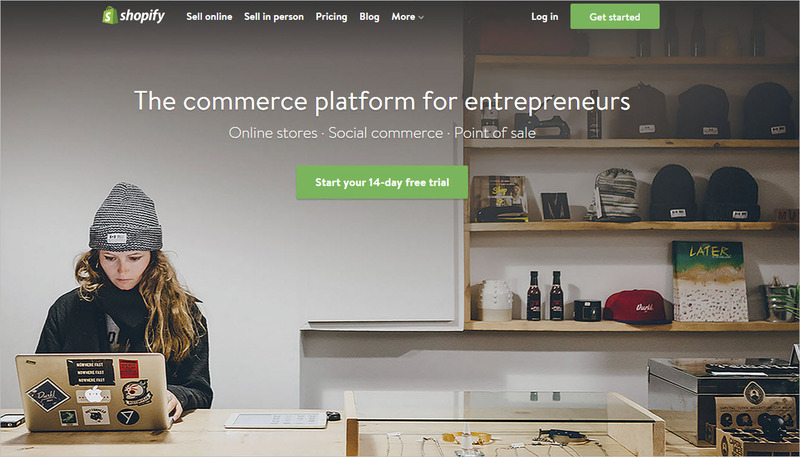 What to try: A simple “Welcome to [company name]”. Many welcome emails just repeat information or contain so many links that readers stop reading after the first couple of lines. 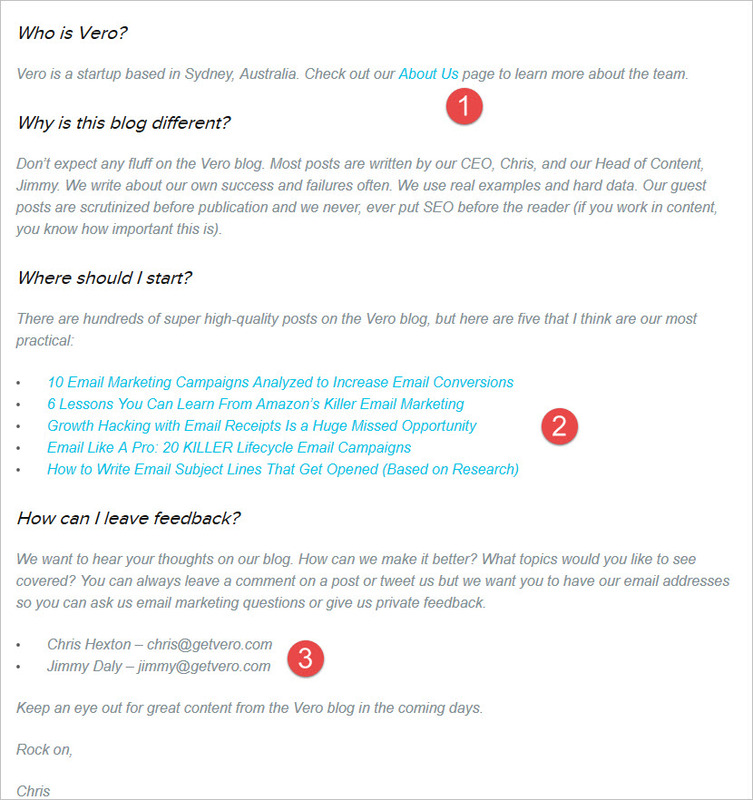 What to try: A single CTA in your welcome email. Next time, try adding a link for readers to log in to their new account, or a reminder about a feature that solves a pain point for the reader, just keep it simple. For example, if it’s a free trial of collaboration SaaS software, a CTA to “add coworkers to your account” may suffice. 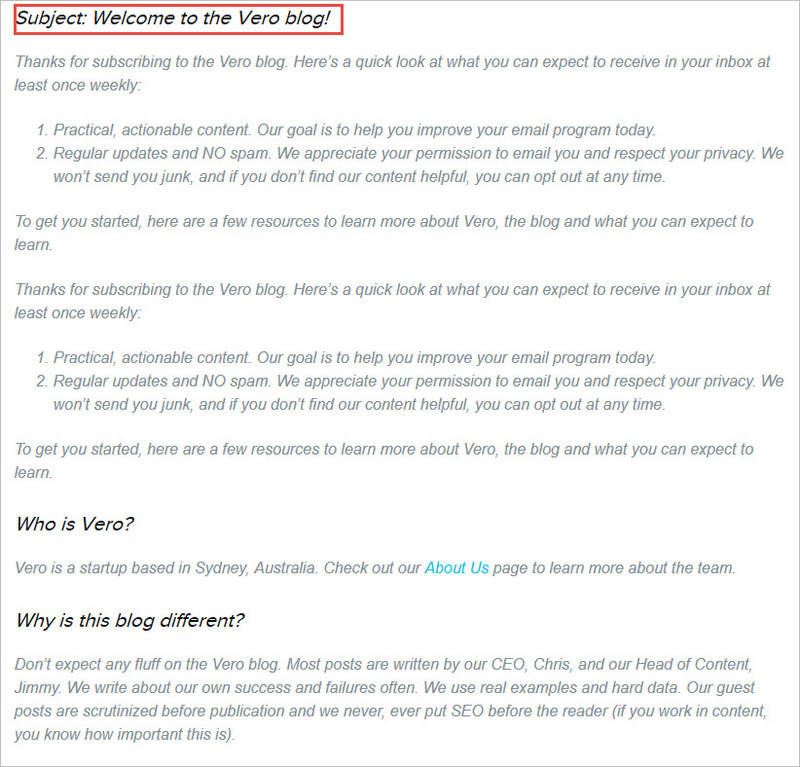 You may have noticed that Vero’s welcome email goes against this idea and has a few CTAs in it. But they’re all very simple ones that readers can choose to see or ignore. The first CTA is a link to Vero’s About Us page. It’s hyperlinked so readers can check out the page, or continue reading. The second CTA is a list of some of the blog’s more practical posts. Again, they’re linked very simply, and the reader can choose to read them now or save them for later. The third and final CTA is a set of email addresses readers can send messages to if they have immediate feedback. Sure, there are three CTAs in the single email, but they’re all pretty simple ones, which is the key thing to keep in mind in your welcome emails. 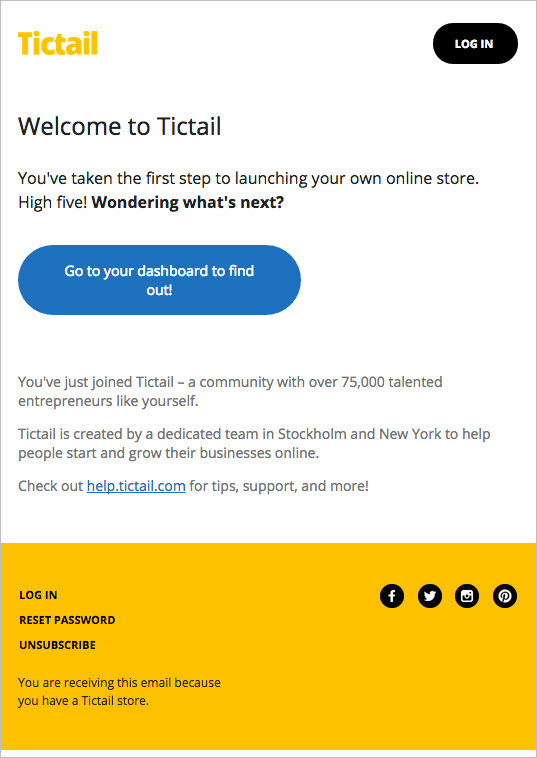 Here’s a better example of the one CTA per welcome email – It’s from Tictail, another ecommerce software solution. After signing up , readers are invited to visit their dashboard right away. Simple and clean, with good visuals to invite readers to click it. To avoid the spam filter of today’s email accounts, it’s important to craft a welcome email that doesn’t look like spam. However, that doesn’t mean you should ignore your current branding to the point that the recipient doesn’t know who you are and why you’re in their inbox. What to do: Colors, logos, fonts, company name, etc. all should reflect what’s on your website right now. Ensure that someone’s always looking at your emails whenever you change your branding. 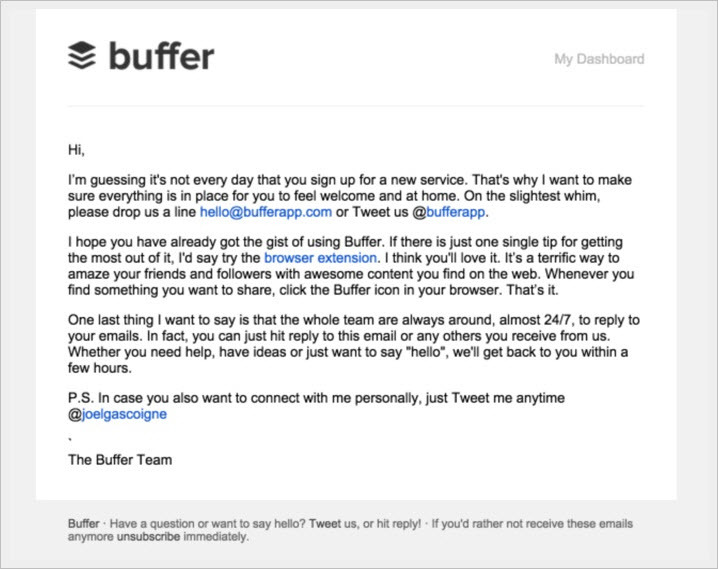 Buffer does a great job in their welcome email, using their logo, font, and colors really well. Shopify’s welcome email does the same as Buffer, but also includes their quirky, casual tone they use with their audience, who are mainly entrepreneurs. You’ve probably got your email signup form hooked into software that sends out responses as soon as someone signs up, right? You want to make sure that the lead doesn’t go cold. Yet doing so gives off a negative impression of your SaaS company. Why? Because it just screams “automated email”. Especially if you’re located in a different time zone. There’s just no way that you’d be sending a personalized email at 3am your time. 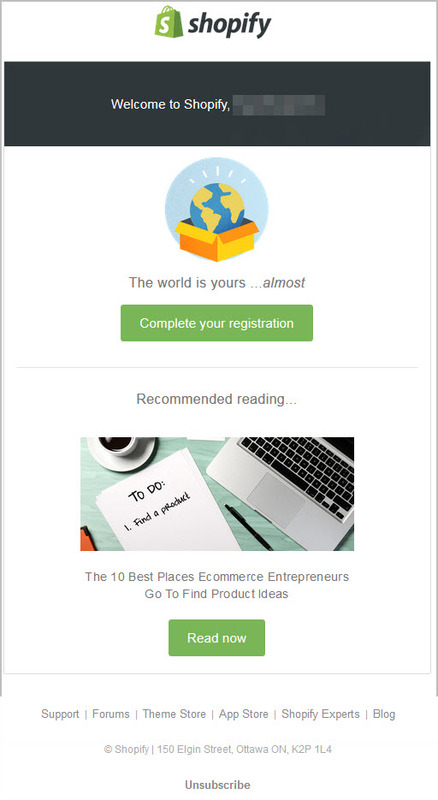 What to try/do: Send out a quick email right away that acknowledges the signup and that’s it. Just a short “Thanks for subscribing. Look for our welcome email in your inbox shortly” kind of message. Then, send your welcome message during YOUR business hours [Author’s note: link this to the other article I submitted on personalizing emails], regardless of where the customer is located. Welcome emails are a tricky thing to do well. Some SaaS companies cram them so full of information that customers run away immediately. The successful companies welcome them simply and directly, and keep them as customers by sending out a well -written and –timed email that provides useful information to them. Use these four tips to set up better welcome emails for your SaaS customers. You’ll look more professional, appear more successful, and earn a spot on their vendor shortlist more often. About the Author: Julia Borgini helps Geeks sell their stuff. A self-proclaimed Geek & writer, she works with B2B technology & sports companies, creating helpful content & copy for their lead generation and content marketing programs. Follow her on Twitter @spacebarpress to see what she’s writing about now.